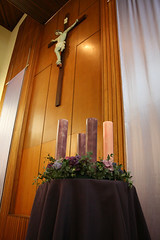 Next Sunday is the beginning of the Season of Advent. Over the four weeks, we enter into a season of preparation. It is a season of devout and joyful expectation; of both the season of Christmas, and the return of Christ at the end of time. Christmas brought us God’s promise of the Messiah. In this year’s Advent season, we will reflect upon the history of the covenant between God and God’s people. Our ancestors of faith, our heritage of belief, will be expressed through the use of the Jesse Tree. Each week, children at the 9:00 a.m. Mass will place symbols of four pre-Christian figures on the tree. They are significant in the relationship between God and God’s people, leading to the Messiah. The symbols, and the people they represent, will be explained in Carmel each week. In part of our celebration of this important season, the rostered readers for each week will be asked once again to attend a preparation workshop. This will be held on each Thursday at 7:30 p.m. in the Church. Finally, I invite everyone to participate in Evening Prayer this season. Using the music and meditative style of the Taizé community (as with our Evening Prayer on the parish feast day this year), these services will provide a prayerful way to enter the season. We have moved the prayer to Wednesday evenings at 7:30 p.m. in a hope that more parishioners may be able to participate.